A 93-year-old female presented to the emergency department with a short history of exertional dyspnoea and right-sided shoulder pain. She was found to be hypoxic on room air. She was an ex-smoker and had a history of well controlled COPD. Despite her age she remained independent in activities of daily living, without history of functional or cognitive impairment. She had a past medical history of macular degeneration, transient is­chaemic attack (2007), subarachnoid haemorrhage (1985) and hypertension. Her drug history was of clopidogrel 75 mg daily only. Clinical examination revealed hyper-resonant percussion note, reduced air entry and decreased vocal resonance on the right. Initially recorded resting oxygen saturations were 96% on 4 L ⋅ min−1 oxygen via nasal cannulae, heart rate was 96 beats ⋅ min−1 and blood pressure 151/63 mmHg. A chest radiograph was performed. What does the chest radiograph (figure 1) show? How should this be managed in the first instance? Right-sided pneumothorax. From the clinical history this is a spontaneous secondary pneumothorax and should be managed by intercostal drain insertion inserted via the Seldinger technique. A seldinger intercostal chest drain (12F; Rocket Medical, Watford, UK) was inserted, with subsequent lung expansion allowing for chest drain removal 24 h later and discharge from hospital 48 h after admission. The patient re-presented 8 days later with ipsilateral recurrence of the pneumothorax that responded to a further intercostal chest drain insertion. She was admitted for a third time 8 days later with recurrent pneumothorax necessitating tube drainage. In light of her recurrent pneumothoraces and persistent air leak on this admission, a chest computed tomography (CT) was performed. What does the CT (figure 2) show? Chest CT (two slices). a) Transverse section of the lung apices, b) transverse section at the level of the carina. 1) Small persisting right-sided pneumothorax with a right-sided intrathoracic drain within the pneumothorax at the level of the mid zone of the right hemithorax, with its tip pointing anteriorly. 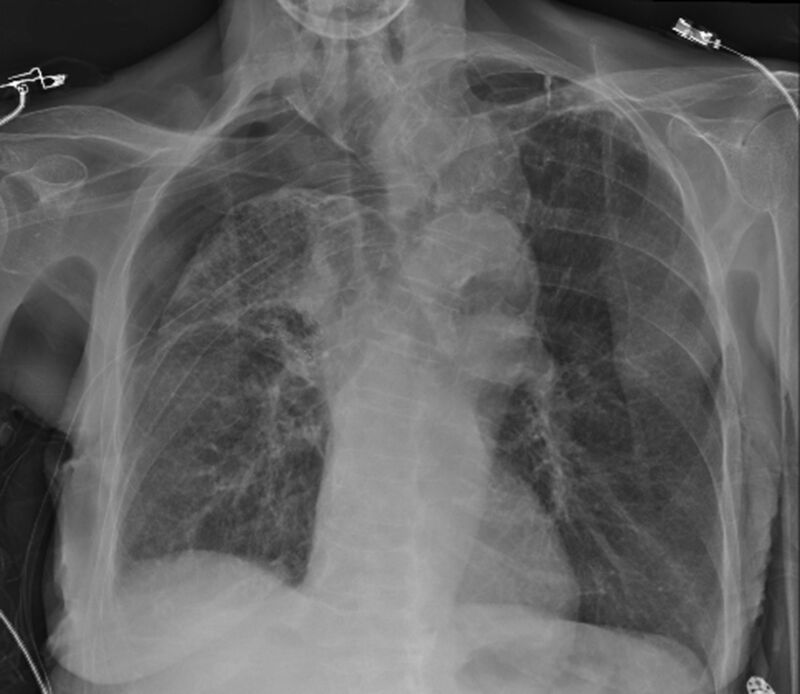 2) Extensive right axillary subcutaneous emphysema. 3) Bilateral centriacinar and panacinar emphysematous changes, most severe at the apices. Numerous large bullae at both apices. Overall the CT shows right-sided pneumothorax with evidence of underlying bullous lung disease. What therapeutic options are available for persistent air leak and a non-resolving pneumothorax? After initial failure of lung expansion, wall suction of 5–10 cmH2O was attempted and was poorly tolerated. Performing surgical intervention with video-assisted thoracoscopy was felt to pose too high a risk in light of the patient’s age and comorbidities. To maximise patient ambulation a portable drainage system using a Heimlich valve was trialled and the patient discharged with close outpatient review. At 2 weeks post-discharge she described increasing breathlessness with reducing exercise tolerance and repeat chest radiography confirmed an increase in the volume of pneumothorax. An additional intercostal chest drain (18F; Rocket Medical) was inserted on the right with a further trial of wall suction. On cessation of suction, lung deflation would occur with intolerable symptoms and a blood patch proved ineffective. The therapeutic options were limited due to the patient’s comorbidities and our focus was on promoting quality of life in an elderly lady who had been previously independent. We had concerns about her risk of nosocomial infection and deconditioning the longer her hospital admission continued. The option of using endobronchial valves was discussed with the patient and her next of kin, and with patient consent we elected to proceed with endobronchial valve insertion under general anaesthetic using a flexible bronchoscope. Temporary occlusion of the right upper lobe sub-segmental bronchi with a balloon catheter was shown to interrupt the air leak and endobronchial valves were deployed using a delivery catheter and loader system. Four valves (Pulmonx Zephyr valve; Pulmonx, Redwood City, CA, USA) were deployed to the right upper lobe via the working channel of the bronchoscope. No immediate complications were documented. The procedure was carried out 109 days from the first presentation. The post-­procedure chest radiograph showed improvement in pneumothorax (figure 3) with expansion of the right lower lobe and there was marked clinical improvement. The patient was discharged 15 days post-­procedure. Chest CT was performed at 6 weeks follow-up, at which point the patient was asymptomatic. What does the CT (figure 4) show? a) Chest CT chest 6 weeks post-valves insertion and b) multiplanar reconstruction view. Resolution of the pneumothorax with successful re-expansion of the lung. The endobronchial valve devices are visible in the right upper lobe. At 6 week clinical review the patient was back to her normal self and was getting out and about, trying to keep as active as possible. The patient, her niece and all the medical team involved are delighted with her outcome. We plan to leave the valves in situ in the hope that she will continue to have a good ­quality of life and avoid further hospital admission. Secondary pneumothorax in elderly patients carries a poor prognosis . Surgical management is complicated by a high perioperative risk related to the presence of underlying chronic lung disease and general frailty. As the proportion of elderly patients in our population grows we will be faced with new challenges in managing persistent air leaks following secondary pneumothoraces. Nonsurgical options include medical pleurodesis, either by talc slurry or autologous blood patch pleurodesis (ABPP); however, these conservative options require successful lung re-expansion. Talc instillation may also result in severe pain in patients with benign pleural disease and there is a risk of intrapleural infection and empyema. Persistent air leaks are associated with increased morbidity, prolonged hospitalisation and increased treatment costs . To date, various methods of endobronchial management of bronchpleural fistula have been used. Early interventions included tissue glue and lead shot , and later interventions involved use of ethanol silver nitrate, cyanoacrylate compounds, coils, lead plugs, balloons, fibrin or tissue glue, antibiotics, gel foam, and autologous blood patches [4, 5]. Watanabe et al. ­developed the endobronchial Watanabe spigot, which is ­effective in reducing air leaks by endoscopic ­bronchial ­occlusion. Initially, endobronchial valves were developed for performing endobronchial lung volume reduction in the treatment of severe emphysema. Endobronchial valves aim to obstruct the bronchial airway, causing parenchymal atelectasis that follows valve deployment whilst allowing drainage of distal secretions. The atelectasis formed is possibly a consequence of the reduction and eventually the cessation of the air leak. Functional advantages of endobronchial valves include the ability to easily reposition valves to ensure functional success and subsequent removal in the presence of any valve-­related complications. The position of the endobronchial valve can be confirmed by a radiograph for follow-up purposes. There are currently two commercially available endobronchial valve devices: the Zephyr EBV (Pulmonx, Redwood City, CA, USA) and the Spiration IBV (Olympus Respiratory America, Redmond, WA, USA). In the largest case series to date, Travaline et al. described complete or partial air leak cessation in 92.5% (n=37/40) of patients treated with Zephyr EBV devices, including cases of spontan­eous, post-­operative, traumatic and iatrogenic pneumothorax. Median time from valve insertion to intercostal chest drain removal was 7.5 days . Gillespie et al. reported use of Spiration IBV devices in seven patients with prolonged air leak related to secondary spontaneous (n=3) and post-operative pneumo­thorax (n=4). During a 15-month period, eight valve placement procedures were performed in seven patients and all had improvements in the air leaks. The mean time to air leak improvement was 4.5 days, with intercostal chest drain removal after a median of 16 days. Endobronchial valve insertion in the management of persistent air leaks in pneumothorax is not currently widely used. They provide a useful adjunct in the management of persistent bronchopleural fistula when conventional interventions are contraindicated or have failed. This brief report illustrates the considerable therapeutic utility of endobronchial valves in the context of an elderly high-risk patient unsuitable for ­surgical treatment. [Surgical treatment for secondary pneumothorax in elderly patients]. Kyobu Geka 2011; 64: 299–303. Treatment of persistent pulmonary air leaks using endobronchial valves. Chest 2009; 136: 355–360.
. New therapeutic application of the fiberoptic bronchoscope. Chest 1977; 71: 237. Clinical evaluation of endoscopic bronchial occlusion with silicone spigots for the management of persistent pulmonary air leaks. Intern Med 2011; 50: 1169–1173. 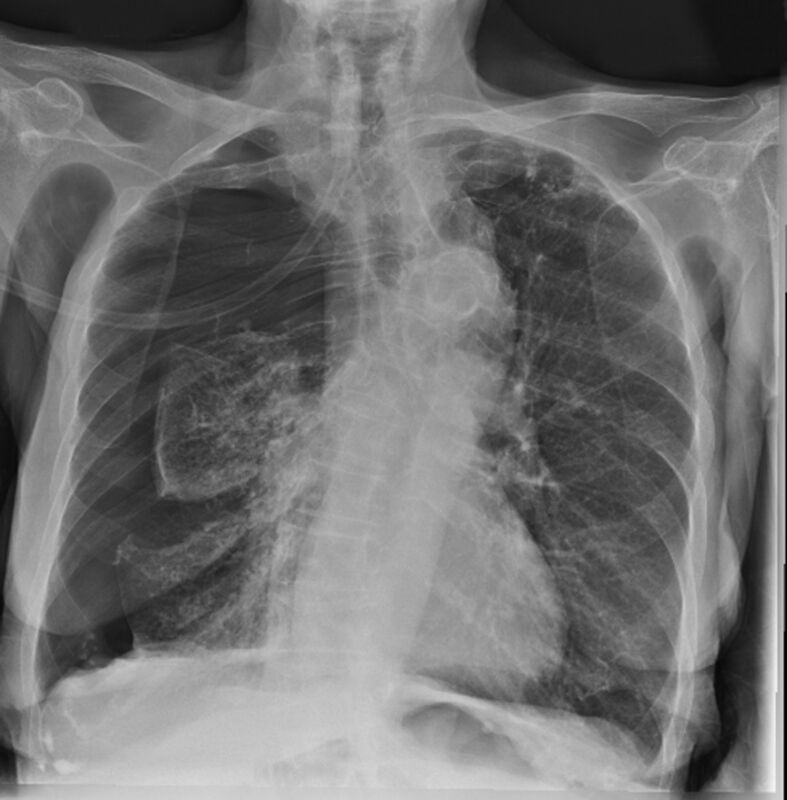 Spontaneous pneumothorax with persistent air leakage and invasive procedures. Intern Med 2013; 52: 2189–2192. Bronchial occlusion with endobronchial Watanabe spigot. J Bronchol 2003; 10: 264–267. Endobronchial valve treatment for prolonged air leaks of the lung: a case series. Ann Thorac Surg 2011; 91: 270–273.